The regeneration of Elephant & Castle Shopping Centre (plus the London College of Communication site) is projected to make its developers Delancey (based in the Virgin Islands, an alleged tax haven), a profit of £154 million. Yet less than 4% of the proposed 1,000 new homes are to be offered at social rent. The plans fail to meaningfully address the future of existing traders, including the large cluster of Latin American businesses. Over 70% of Aylesbury Estate residents said ‘no’ to the redevelopment agenda for their estate, but Southwark Council simply ignored their own consultation. Previous experience of the Heygate demolition suggests council tenants will be rehoused in scattered locations across Southwark, losing their communities while rents may increase. Harkers Studio housed a local business which served both the theatre industry and the wider arts community. The Council has granted planning permission to redevelop the building into flats and office space, without much consultation. diverse local traders and creative industries are protected, instead of being indifferently cleared out of the way. Read on for news about Southwark Green Party's campaigning related to a right to community in regeneration schemes across Southwark. Southwark Green Party submitted today its objections to the Canada Water Masterplan. Despite further changes made by the developers in response to mounting local opposition, the vast majority of our serious concerns remain unaddressed, and we continue to support the wider community campaign opposing the planning application. Just 8 days after the Council elections, British Land submitted its planning application for the Canada Water Masterplan – handily ensuring there was no opportunity to debate it during the election campaign. Only three sites are set out in detail. Yet as the developer has submitted a “hybrid” planning application, British Land will not require any further planning applications provided they stay within these (very broad) outline plans. Southwark Green Party has repeatedly raised serious concerns over the Canada Water Masterplan proposals, which have not been addressed. We are now supporting the wider community campaign opposing the planning application. Nearly 20% of Southwark’s 63 councillors work as lobbyists, found 2013 research by journalist Anna Minton. One of these is East Walworth Labour councillor Rebecca Lury, who works as a managing director for public relations (PR) firm GK Strategy. Her firm has a specialism in advising development corporations seeking contentious planning permission from local councils. Councillor Lury volunteered support for planning permission for Trafalgar Place (Elephant Park phase 1) with social housing quotas slashed in favour of fat profits. Two former leaders of Southwark Council, Jeremy Fraser (Labour) and Nick Stanton (Lib Dem) went on to similar lobbying/PR careers. Independent local campaign group The 35% Campaign has collated numerous similar examples at 35percent.org/revolving-doors. 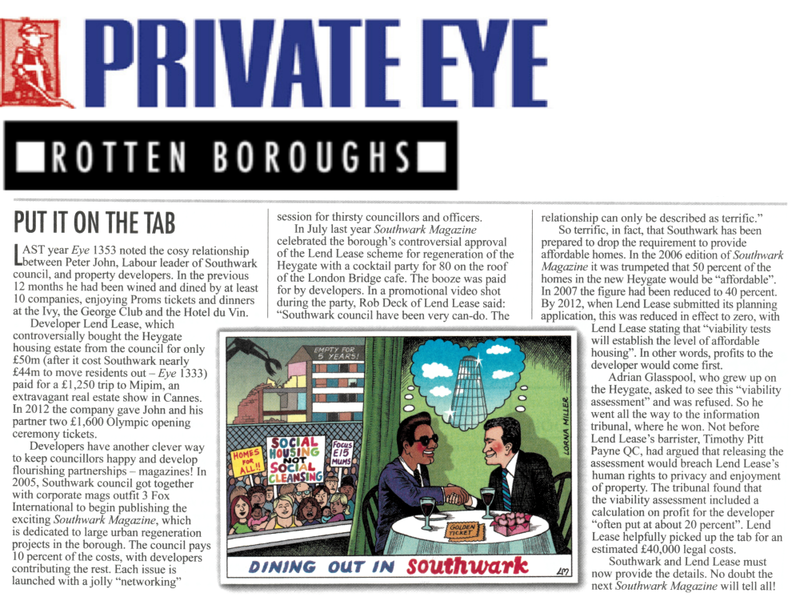 Private Eye magazine reported that many companies have wined and dined Peter John, current Labour leader of Southwark Council. Freebies accepted from developers Lend Lease include two £1,600 tickets to the London Olympics opening ceremony, and an expenses-paid trip to Cannes for a property show. Lend Lease are building £2.5m penthouses on the site of the demolished Heygate Estate. Betiel Mehari is a single mother who became a housing activist to try to save her own home. Betiel works in retail on a zero-hours contract. She lived on the Loughborough Park Estate in Brixton for 11 years, until her family lost their home when the estate was completely demolished by housing association Guinness Partnership in a £75m "regeneration" scheme. She was forced to leave Brixton, losing her much valued local community, with huge disruption to her family. ("That's what regeneration does," she says.) Rehoused in a smaller flat in Newington with no balcony, her two children (aged 11 and 10) are now commuting the lengthy distance from Newington to Brixton in order to maintain their educational stability and friends. Furthermore, Guinness whacked up the rent in the family's new flat, from a "social rent" of £109 per week to a so-called "affordable rent" of £265 per week. Although Betiel had been a Guinness tenant for 11 years, Guinness claimed that demolishing her flat and rehousing her had created "a new tenancy". Betiel says: "'Affordable' rent is a con. You'd assume it's based on wages, but it's not. It's set at 80% of market rents, not according to any measure of actual affordability. With two kids it requires an income of £35,000, which is higher than the national average. This measure puts us at the mercy of the housing market - it's absolute madness." "Before the application we hadn't seen local councillors for 2-3 years"
Diverse small traders facing displacement in Elephant & Castle regeneration are already having their livelihoods damaged by Southwark Council indifference. The Latin American community hub remains particularly at risk without proper guarantees. Elephant Artworks boxpark will be closing down by the end of this year to make way for new flats. Developers Delancey are offering a 'new' boxpark as replacement temporary accommodation for displaced Shopping Centre businesses. Yet Elephant-based lawyer Adriana Hoyos Rojas, Latin community rep in the Elephant traders' deputation, said: "We first heard about this on social media. We've not been told the cost, quantity or duration of units in the 'new' boxpark. Traders have no information about notice to vacate. Legal advice offered to traders is not independent. In December, property developers Delancey put in an application to demolish Elephant & Castle Shopping Centre and London College of Communication. Councillors on Southwark Council’s Planning Committee refused to approve the plan, yet accommodated an eleventh-hour promise from Delancey to make an improved offer. This means the committee will hear the proposal again this month. Meanwhile, the Shopping Centre is being run down, conveniently bolstering the claimed 'need' for demolition. Certain entrances are now being closed during trading hours (right). Empty units are no longer available for re-let, enhancing a 'ghost town' feel. Escalators have been left broken for long periods. Pedestrian access has been unsatisfactory since removal of subways. Yet the building is structurally sound and could be imaginatively refurbished, re-landscaped and re-clad. This would avoid nine years of environmental destruction, intense construction noise, degraded local shopping and leisure facilities, and enormous disruption to nearby residents' home delivery access. "Opportunity for change": Opportunity for whom? We all know the answer to “Opportunity for Whom?” Disregard for existing communities has been the keynote of the Elephant & Castle Opportunity Area. The Mayor’s new London Plan has big ambitions, in particular the target of 65,000 new homes a year, delivered mainly through additional Opportunity Areas across the city. But they will fail unless London stops ignoring or actively displacing existing communities in so-called regenerations, and instead puts them first. A formal recognition of Existing Communities would include a Right to Community, with clear definitions of community and a set of subsidiary rights, including to clean air. This is an opportunity for change: combining big principles, clear entitlements, and a guerilla localism to bring the benefits of development home. Elephant & Castle regeneration plans: Local community to win improvements? Property company Delancey has been forced by huge local community pressure to reconsider their redevelopment offer for Elephant & Castle Shopping Centre and the London College of Communication site. 700 formal objections were lodged. Less than 4% of the proposed 1,000 homes were to be at social rent. The plans failed to meaningfully address the future of existing traders, including the large cluster of Latin American businesses. Delancey, based in the Virgin Islands (an alleged tax haven), are projected to make a profit of £154 million from the scheme. Aylesbury residents have been fighting plans from Labour-run Southwark Council to demolish their homes. The second public inquiry is due to complete in April. Across the Aylesbury, 2,700 council homes are to be destroyed. None will be built in their place. Previous experience of the Heygate demolition suggests council tenants will be rehoused in scattered locations across Southwark, losing their communities while rents may increase. Aylesbury Estate homeowners are being hit with Compulsory Purchase Orders (CPOs) which will force them out with payoffs much too low to buy any other property in the area or even in London. The UK Government previously recognised that Southwark’s plans breach the homeowners’ human rights.